Say hello or thank you to a friend. Handmade and creative cards for all occasions. Default Popularity Newest products Lowest price Highest price Name ascending Name descending All brands S.L. Revival Co. 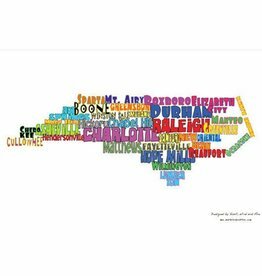 Designed by SL Revival, Towns names make up the shape of North Carolina, Ten fun facts about North Carolina located on the back, Card sized 4"x6"